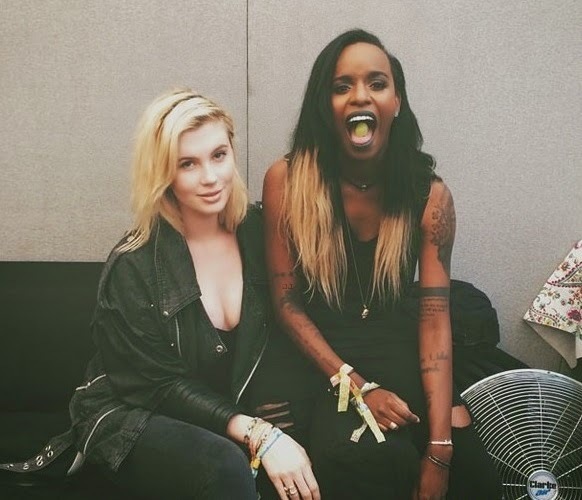 Ireland Baldwin shared a photo wearing a Doloris Petunia bracelet on Instagram over the weekend! The model hung out backstage at the 2014 Glastonbury Festival wearing her Original Swarovski Crystal Friendship Bracelet ($35). A favorite among celebrities, the Doloris Petunia friendship bracelets were also recently seen on Olivia Munn, Nina Dobrev, Alessandra Ambrosio and Whitney Port (www.dolorispetunia.com)! Ireland Eliesse Baldwin is an American fashion model. She is the daughter of actors Kim Basinger and Alec Baldwin.